Twitch streamers sure know how to pull cool stunts. 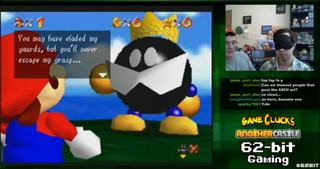 Case in point: there is a channel where a speedrunner attempts to play through Mario 64...without being able to see what's going on on the screen. Think they'll be able to beat the game like this? If Twitch Plays Pokemon can pull it off, so can these guys, is my bet. As of this writing, they already have a star!